Primary school children in nine schools across Merseyside can look forward to a full curriculum of winter sports this term following an extensive aeration and drainage operation earlier in the year. 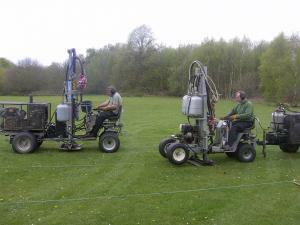 Dave Connor, Construction and Development Officer for Knowsley Council in Liverpool had the foresight to bring in one-metre deep de-compaction experts, Terrain Aeration during a dry spell last spring to treat twelve winter sports pitches and play areas ahead of winter weather conditions. "The fields were poorly drained because; I think the 60 year old field drainage employing 75mm serrated clay pipes had got blocked up. It wasn't efficient at all," he says. "Rather than go down the traditional route which would have meant digging the areas up and putting in new pipe work we decided to opt for one-metre deep air injection which was much more cost effective and is guaranteed for 8 to 10 years." David Green, Terrain's MD who put the company's Airforce and two Airforce Scamper terralift machines to work on the sports fields for the best part of a fortnight says that the area used to be part of the flood plain for the River Mersey. "It's flat, relatively low lying and has problems with clay," he explains. "In times of flood where there's a high flow in the channel the river wouldn't be carrying anything much more than pebbles. We punched through the clay into the gravel." Not only are the sports fields now draining efficiently but Dave Connor appreciates the lack of disruption to the schools concerned. "Treatment was carried out in the morning and the kids could come out to play in the afternoon," he remembers. "This form of aeration doesn't affect the surface."